Fixes introduce more errors. You need to start with clean head and calm attitude. Wise words Sir, the router is feature packed, but unfortunately, using stock firmware and config, its a disaster. It needs some fiddling. Please try using Travelmate, you can look it up in this thread, the devs gave all the details to install it. It’s working fine for me, rock stable, just like a regular full size Router. Also, I have recorded the sound it makes, I thought I was the only one noticing it, thanks for the hint, if it stops working, I’ll check the capacitor. disabled GL Health and tried Travelmate which seemed pretty good but alas, when I updated to try a testing version of the VPN policy routing firmware, Travelmate and it’s settings were gone! So, I am back using it under 5GHz Wisp (repeater mode). I personally won’t update it at all. I turn down the TX power of both the radios and wonder if this is why I haven’t seen the dropout issue during my testing at home. About to put my slate to some serious use so will update as I go. That’s an interesting idea - am trying it myself right now! Then it could be simply a bad internal power circuit. Explains noise heard too. Yes I will in few hours. Since it is currently up since yesterday but no visible SSID is there. I need to reset it in other room. Here is all logs and procs remember that I needed to reboot before able to login to router. Due to no SSID in both frequencies. Thank you. I don’t see there has any exceptional situation. There have one station connected to 5GHz, and one station attempt to connect to 2.4GHz, but maybe key wrong. So 2.4GHz and 5GHz is up. I don’t see there has kept disconnectting, it only try one time when boot up, is the router work as expected when you get the log? I am quite capable in terms of networking and computer engineering. So key is not wrong. How can it be? If it it is that means router is losing the key. As far as the disconnect and connect cycle is concerned probably it did that many many times and finally rebooted and dropped SSID’s. SSID’s were not present. SO I did power cycle to be able to connect to access to the log. Operating system may think it is up but since it is down. Operating system is wrong I am really capable of measuring whether an SSID is really not present. I really sympathize your kind help but in most cases as in this case, the approach of customer service is to start issue with a belief that the product is perfect and it is configuration and user error. I have been using routers since 1990. This router has firmware problems and I don’t know how you handle that. Because I am not into your development team. But the problems are significant. My suggestion would be checking hardware design and see whether there are interactions with the software. That will take time but will keep you in the bussiness. Again thank you and I will be helping you to sort out issues with 750s and giving feedback. 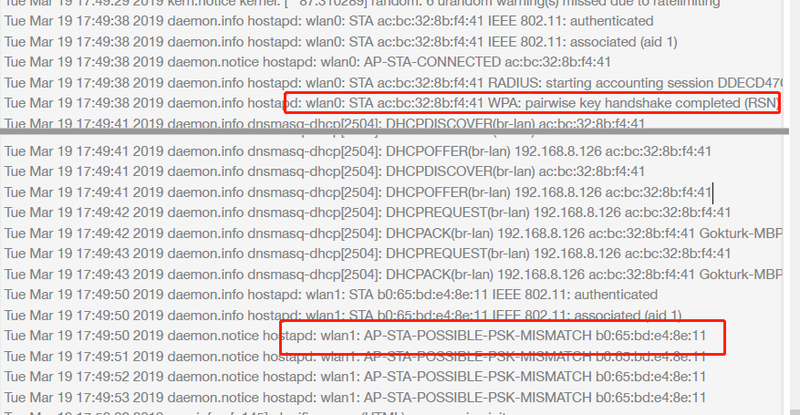 The logs says “possible PSK mismatch”, it maybe a wrong key or maybe other reasons. I trust your IT level and appreciate you can help. The repeater manage does has some bugs: it blacklist some wifi network quickly because of various reasons. We are working hard to fix and optimize the connection policy and will release test firmware quite soon. So stay tight. Now the repeater manager works in most cases and when it works it works good. But in some scenario it has problem it always has problem. This is why you tried various way but it cannot help. But this will be fixed. @Alzhao : my experience is everything works fine except 2.4GHz repeater/WISP… For me, it disconnects constantly, and I also have the “possible PSK mismatch” message (obviously the key is not incorrect or it would NEVER connect in the first place. I have disabled GL Health and tried Travelmate. However,it still disconnects, so it would appear that the problem is not your repeater manager (GL Helath) but something else. Signal is not good or interfered. In some cases even you have correct wifi keyit will report wrong key. The router’s wifi chip and the wifi network’s wifi chip are not compatible with each other. This happens rarely but it does happen. Thank you I really apppreciate your patience. Well, I don’t think it can be this in my case, as the AR300M I replaced with the Slate worked (almost) perfectly. Also, the signal is five bars and only 5 or 6 meters away. Could you please PM me your Email? So that I will send a new testing firmware for you. We had optimized the repeater, and tested it in the airport, it works well. I will appreciate you can test and feedback. Kindly post the firmware in the testing directory so that we can all test it! I am traveling right now to 5 African countries in the next three weeks. I would like to thank you for including me in this test, also thank you for the efforts put into this firmware, the results very promising. After some testing using the new firmware, I can tell you that the router is working far better than what I was expecting. The connection is solide and I don’t experience anymore frequent disconnections as before. I can say that it’s working as good as using the travelmate plug-in. One small problem I have noticed so far is, some random quick disconnections from time to time, 3 to 4 times per day I may say, where my devices looses internet and at the same time, I won’t be able to access the admin page anymore, they reconnect quickly to the wifi but stay offline, I have to disconnect manually by turning off and on the radio to get it to work properly. Internet will be restored and the admin page also will be accessible again. I think that maybe when the slate looses connection to the main router (internet provider), it shuts off wifi then get it back on quickly, this may lead to confuse the devices and then I will need to reconnect them manually. Is it possible to keep the connection alive when the slate looses connection to the main router, even if there is no internet, it’s better to stay connected to the slate and when it restores connection with the main router, internet will be available to the devices again. I have installed the test firmware you sent me and I am using the Slate as a WISP repeater. The Slate is connected to a 2.4ghz ISP WiFi and broadcasting 2.4 and 5ghz internal WiFi. So far, the connection has been completely stable. Looks like this new firmware is a vast improvement. Thanks very much for your efforts. 3- 2.4 ghz bandwidth is terrible. (no vpn is used). To check whether I have problem on the other side, I tested my tplink MR-3020 instead for the same purpose in wisp mode. No problems… In my summer home, another MR-3020 has been working for more than a year without reboot. doing wisp. I believe one piece of code is doing this and we need to find it.